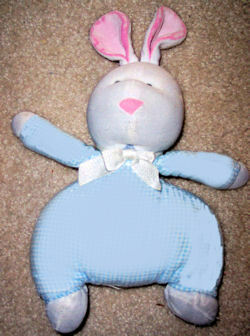 I am looking for a blue bunny rabbit that was made by Sweet or Soft Dreams in 1999. I bought it at Meijer in Champaign, IL. It looks very much like the velour Eden bunny on your website, which I have just bought. The original pyjamas were blue chenille, the ears were white and pink and the ribbon was white. It is about 8 inches tall. If you can help Manon find this White Bunny with a Blue Chenille body, THIS SITE IS NO LONGER ACTIVELY MANAGED. Please use Our FREE FACEBOOK GROUP, including #052708-5 in the subject, . It is called “soft dreams”. I saw some pink ones on ebay but no blue ones yet. I’ll change the listing. Thanks! Let us know if your still searching.